Every fashionable man or woman needs a fashionable drink. 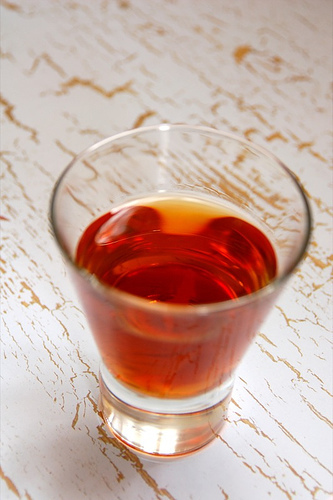 Reader, meet The Sazerac, an old New Orleans institution and the perfect end of summer, entry into fall beverage. As with any classic cocktail, this one doesn’t come without its recipe variants. But as long as you pour in anything alcoholic, all arguments will soon be muffled anyway. General consensus, however, dictates it should contain Rye Whiskey or Bourbon, Pernod (the best thing on the planet), maybe Absinthe, bitters (Peychaud is the preferred brand), some sugar, and a lemon or lime rind, if available. 1. Ask bartender if he knows what a “Sazerac” is. 2. Soak in his imminent look of deep respect. 3. Counter with look that says, “yeah. That just happened.” Let him do his thing. 4. Write name and address on back of coaster. You’ll need this later when you attempt to go home. When are you going to start selling mad ad space on your blog and getting the payperclicks rolling? que pasa… I think many a boutique/bar/mag would snag banners all over the place. And when does the snail mail collateral arrive? I’m dying to see it.